SPECIFICATIONS AND DETAILS: The Dreambaby Retractable Indoor/Outdoor Gate is designed to fit inside doorframes up to 55in (140cm) or outside doorframes up to 51in (129cm). Note: please measure openings before purchasing a gate. Spacers (sold separately) required to accommodate baseboards/skirting boards. ELIMINATE OBSTRUCTIONS: When the Retractable Gate is open, it retracts completely out of the way so there is no maneuvering with gate doors. It does not have a bottom base or bar, eliminating any tripping hazard. SINGLE HANDED OPERATION: Dreambaby works to make parents and pet owners' lives as simple as possible. Using it single handedly, the first step is push and turn the button to unlock and release, the second step is to hold the handle and gently release the gate- great for when you're juggling multiple tasks at once. Note: The gate has a warning sound to alert you it is being opened, but if you need to close it silently, you can do this but you will need to use two hands. EASY TO RELOCATE: The Dreambaby Retractable Gate includes two sets of mounting hardware for use in more than one location. You could install the mounting brackets in your living room and on the porch so you can move your gate seamlessly to where ever you're relaxing. 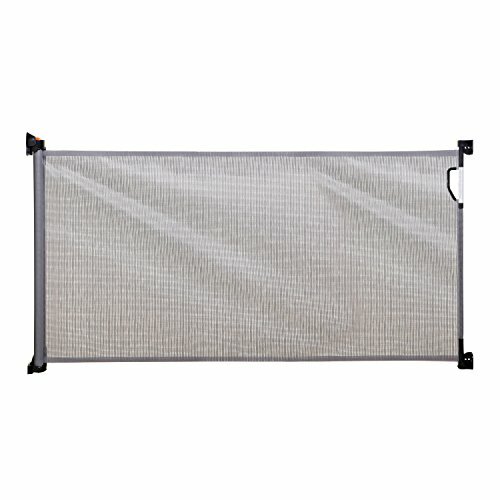 DURABLE CONSTRUCTION: The Retractable Gate is made from high quality mesh, designed to hold up to little hands, giving you greater peace of mind. It is also UV treated to prevent fading in the sun, maintaining its pristine look longer. Fits openings up to 55"